A whole night of festive cheer & comedy! You will see a brilliant selection of comedians, in a brilliant atmosphere, with The Bullingdon providing the cocktails and after party! Our club is located in The Bullingdon on Cowley Road. The Bullingdon's cocktail bar will be open from 5pm, so you can join us for a drink in there and gather your group before coming through to the comedy. The doors to the comedy open at 6.30pm, and last entry is 7.15pm. The comedy show will begin at 7.30pm. Seating is unreserved, so it is essential that all members of your party arrive in good time to take your chosen seats and ensure a smooth start to your festive celebrations! The Bullingdon bar will be open from the beginning of your evening until last entry, and will re-open during intervals and after the show. Shows will finish at approximately 10.00pm, when you are welcome to join revelers in the front bar where Dj's will entertain until the early hours. Our auditorium is set out in theatre-style, with unreserved seats in rows facing the stage. Please note: the room may be cleared of these seats after the show. 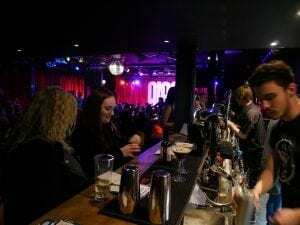 Glee is a great night out, whether you are a couple on the tiles, or a larger group. The capacity’s the limit! If we’ve got the seats available, they’re yours for the taking. People have dropped out. What can I do? If you have any drop-outs, please get in touch and we’ll see what we can do for you. 0871 472 0400. Unfortunately not. However, there are some great restaurants on The Cowley Road where we are situated, to eat before or after the show. Can I get a bar tab? 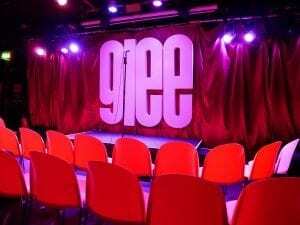 You can login to the MYGLEE section of the website at any time, to take a look at any current bookings you have with us. We will be in touch during the process of your Christmas booking, most of our correspondence will be via email. Please save us to your email contacts, so we don’t get stuck in your spam filters! We are a ticketless venue, it's less hassle for you, and saves a few trees. Once you have booked you will receive an email confirmation of your booking. This is for your own records, there's no need to print it, but do read it through. Upon arriving at the club, we just need the name you booked under, this will gain you entry. If you are unaware of who in your party organised the group, please give a company name. All comedy shows in December are strictly 18+. The security operate a Challenge 25 policy, so please have your id handy if you're lucky enough to look under 25! Go on then, it’s Christmas after all! Our after party is primarily for comedy customers, but we don’t mind if Karen from the office wants to pop along to join in with your company’s Christmas celebrations. As ever, we’ll need to see ID if they are lucky enough to look under 25! Our venue is located on Cowley Road, and has good access to accommodation and transport. Please take a look at our Venue Info page on our main website for further practical details.